This year's theme for the Summer Open Day is "Food and Agriculture Experience: Let's play and learn". There will be lots of tips and ideas that will help schoolchildren in preparing their homework during the summer vacation. And various activities and events designed for both parents and children to enjoy. ※ Registration desk is open until 3:30 PM. 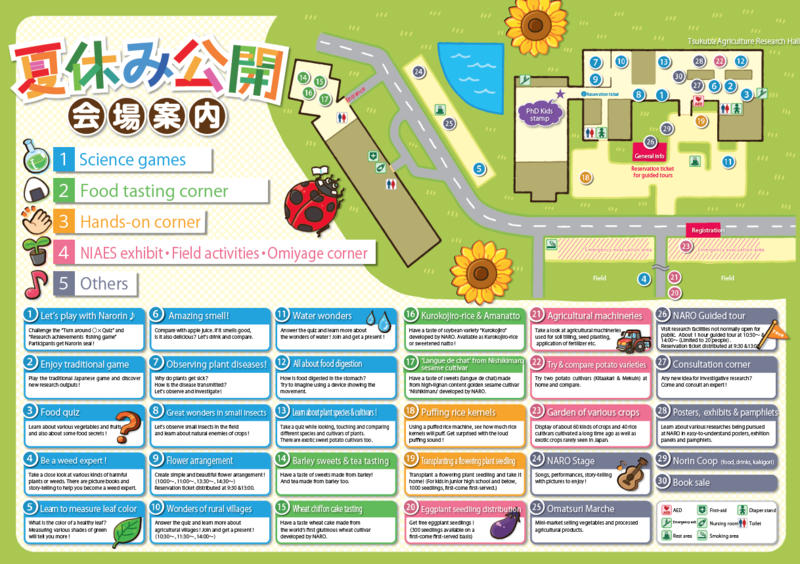 ※ To those coming by car, please note that some roads are closed to the public on the open day, and please follow the directions of the parking staff. Click here for the Parking map. As it is the peak of summer, please bring drinks and make sure to take all measures to prevent suffering from heat stroke. The NARO cafeteria is closed on that day and there are no shops and stalls selling food or bento. In case of emergency, please check the guide map you will receive at the reception. Please be forewarned that there is a possibility that mass media people may be around to do interviews.